Executive Secretary of the UN Economic and Social Commission for Asia and the Pacific Noeleen Heyzer. While Asia and the Pacific faces another year of slowing growth as demand for its exports declines and capital costs rise, it will remain the fastest growing region globally and an anchor of stability in the world economy, says a new United Nations report released today. The Economic and Social Survey of Asia and the Pacific 2012: Pursuing shared prosperity in an era of turbulence and high commodity prices, adds that commodity price volatility is another major concern for the region, which also faces a long-term trend of rising commodity prices. According to the report, the flagship publication of the UN Economic and Social Commission for Asia and the Pacific (ESCAP), the growth rate of the region’s developing economies is projected to slow down to 6.5 per cent in 2012 from 7.0 per cent last year, compared to a strong 8.9 per cent in 2010. However, the slowdown in growth will help lower inflation in Asia and the Pacific, which is projected to moderate from 6.1 per cent in 2011 to 4.8 per cent this year. “The Asia-Pacific region continues to face a challenging external environment, which is why the focus of the 2012 Survey is to map the landscape to help steer through turbulence and volatility,” said the Executive Secretary of ESCAP, Noeleen Heyzer, while launching the report in Bangkok. Despite the slowdown, the region will remain the world’s fastest growing with China forecast to grow at a robust 8.6 per cent and India at 7.5 per cent in 2012. The Survey also highlights a number of key policy challenges and options for Asia-Pacific countries. They include managing the balance between growth and inflation; coping with capital flows and dealing with considerable exchange rate volatility; and addressing jobless growth and unemployment. It notes that another priority for the region is to ensure more inclusive growth, given that levels of income inequality have grown by 15 per cent in developing Asia-Pacific economies since the 1990s. The Survey notes that over one billion workers in the region are in vulnerable employment, with developing countries failing to generate sufficient work opportunities in the formal sector. Young people are three times more likely to be unemployed than adults with the region’s youth unemployment rate projected to remain at 10.2 per cent in 2012. “What we should do as we look at the short-term challenges in Asian and Pacific countries is also to look at what should be done over the medium-run to get to a shared prosperity that is particularly addressing inequalities,” said the Director of Development Policy and Analysis Division, Robert Vos, of the Department of Economic and Social Affairs, as he launched the report at UN Headquarters in New York. 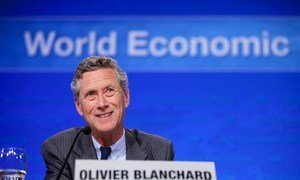 The prospects for the global economy are slowly improving, but growth is expected to be weak, especially in Europe, according to a United Nations-backed report released today.